Morrell Groom "Chum" Allen, 79, of Ohio City, died at 12:50 a.m., Tuesday at the Van Wert County Hospital. He was born on February 25, 1935, in Detroit, Michigan, the son of the late Carol M. and Eleanor Margaret (Groom) Allen. He married the former Thelma Mae "Tootie" Wiseman on June 19, 1968, and she survives. Other family members include a daughter, Nancy J. (Kurt R.) Muntzinger of Van Wert; two sons, Randy L. Allen of Missouri City, TX and Rick L. Allen of Van Wert; a step son, Phil Simindinger of Ohio City; six grandchildren, Andy J. Berelsman, Heather Simindinger, Jason Allen, Jennifer Allen, Christopher Allen and Amber Walters; and two great granddaughters, Adele and Eleanor Berelsman. He was preceded in death by a sister Nanette Wilcox. 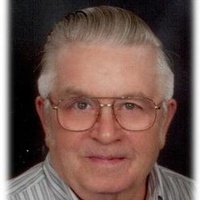 Chum was a 1953 graduate of Van Wert High School and a Korean War veteran of the U.S. Navy. He was a member of St. John's Lutheran Church in Ohio City. He retired as a maintenance supervisor at Aeroquip Corp. after 32 years of service. He was a member of Harvey Lewis Post #346 of the American Legion in Ohio City and served as Ohio City village councilman for eight years. He was a member and past president of the former Pleasant School Parent Teachers Association. Services will be held at 10:30 a.m., Friday, June 20, 2014, at Cowan & Son Funeral Home with Pastor Denise Brown officiating. Interment will follow at Ohio City Woodlawn Cemetery where military rites will be conducted by Harvey Lewis Post #346, the American Legion. Calling hours are Thursday 3 - 8 p.m. Preferred memorials are to the American Legion Post at Ohio City.